Laurel Palou will long remember the day of July 30th, 2001. As Laurel and her companion Kenyon Wells were fishing along the rugged shoreline north of The Bluff, her rod hit. Kenyon knowing better than to touch her rod sat back while Laurel battled the monster salmon. After a long fight Kenyon slipped the net under Laurel's prize, a 64-pounder. 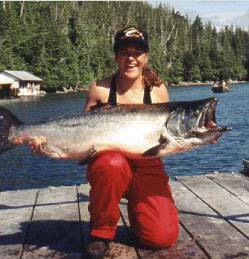 With the largest salmon of the season for Black Gold, Laurel wins a free trip for 2002.